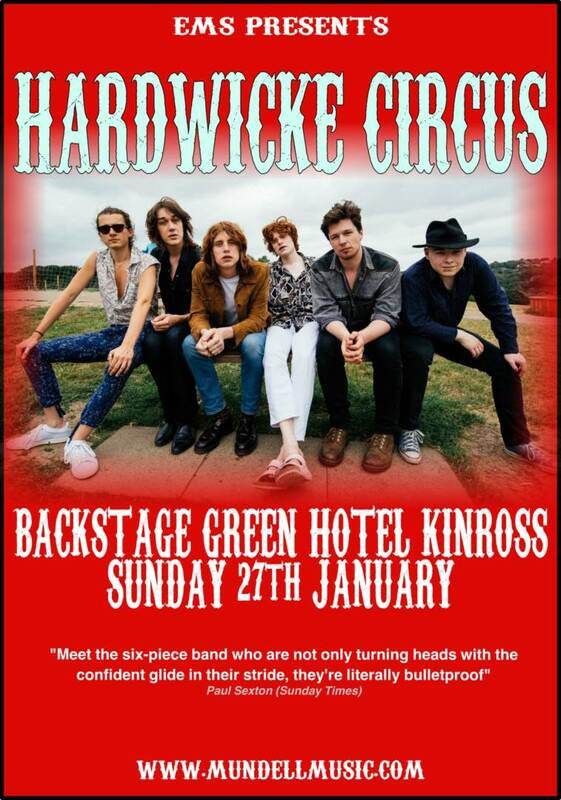 Hardwicke Circus play Backstage at the Green Hotel Kinross on Sunday 27th January 2019 at 8.00pm for EMS /Mundell Music. Tickets £15. Buy Tickets HERE. Meet the seven-piece band who are not only turning heads with the confident glide in their stride, they’re literally bulletproof. Right now, on the highways and byways of this United Kingdom, the members of Hardwicke Circus may well be speeding to their next gig location in their customised police riot van. Even if it’s a bit cramped in the back there, this band’s mode of transport is as distinctive as their exciting sound, and yes, it’s bulletproof. Not to mention that as they motor along, they’re fuelled by their own award-winning blend of coffee. More of that to come. You certainly can’t say there aren’t some unusual angles to this story. 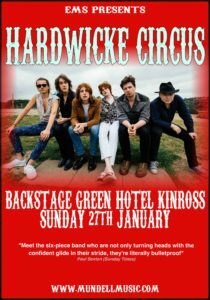 Hardwicke Circus are fast building a reputation as one of the most vibrant rock bands to emerge from the UK in recent years. 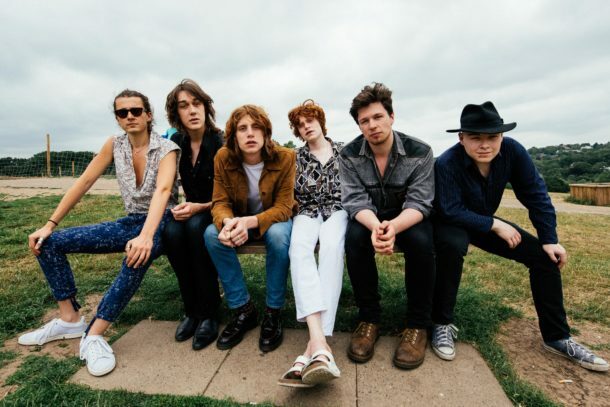 Their blues-rock sound brings comparisons with the brio of the E Street Band or Southside Johnny and the dark passion of classic Doors, but with plenty of British authenticity and perhaps even a hint of Dexy’s in their horn-laden attack. With every new show, more and more fans get on board, because this is a group where there’s so much to watch as well as to listen to. The focal point of it all is lead singer and chief songwriter Jonny Foster, who draws the eye as he exudes all of the ‘Brown Sugar’-era swagger of Jagger. But on stage and on record, there’s also an echo of the energy of such modern-day heroes as Arcade Fire. “It’s a very visual thing, and I think people like to see the seven of us on stage,” avows Foster. “You don’t really find that in modern bands. I’ve always liked the big band and I always aspired to play in one, with cinematic songs. To have seven people channel that same vision, I think we’re really lucky. It’s not just their ever-expanding army of fans that are voting with their feet, either: the band have the enthusiastic support of a remarkable triumvirate of rock and pop production gurus. In the spring of 2017, they served notice that they were speeding ahead in the outside lane with the ‘Social Music’ EP, and that was just a taste. They’re following it up with another four-tracker featuring the studio expertise of Peter Collins, the vastly experienced producer of countless giant names from Bon Jovi to Alice Cooper to Rush; Stephen Lipson, similarly respected for his work with the likes of Annie Lennox, Grace Jones and Frankie Goes To Hollywood; and Chris Tsangarides, whose resumé stretches from Thin Lizzy to Depeche Mode. The band’s story begins with Jonny and his younger brother Tom, their drummer, making a lot of noise. The older sibling tells the story with style. “We’ve been playing together from a young age,” says the frontman. “Our parents let us make us much racket as we needed to, in the attic of our house in Carlisle, and we were jamming songs by Led Zeppelin and Jimi Hendrix. “We did our first ever gig at our primary school. Every year they’d do a musical evening and invite all the parents. The music teacher taught the class acoustic guitar, and me and Tom come from the attic and play ‘Teenage Kicks’ by the Undertones. The teacher was called Mrs. Baskerville, and she was horrified by the whole thing, so her name was apt. It started from there.